Possessing a majestic natural beauty, Ban Gioc can make you fall in love with it when you hear about it. Talking about Ban Gioc is talking about one of the most magnificent and beautiful waterfalls in Vietnam. It is ranked in the top beautiful waterfalls in the world. A tour to Ban Gioc waterfall will give you an exciting and fresh experience you have never had. To make the trip more perfect, you can refer the following travel guide. It will be quite helpful for you. 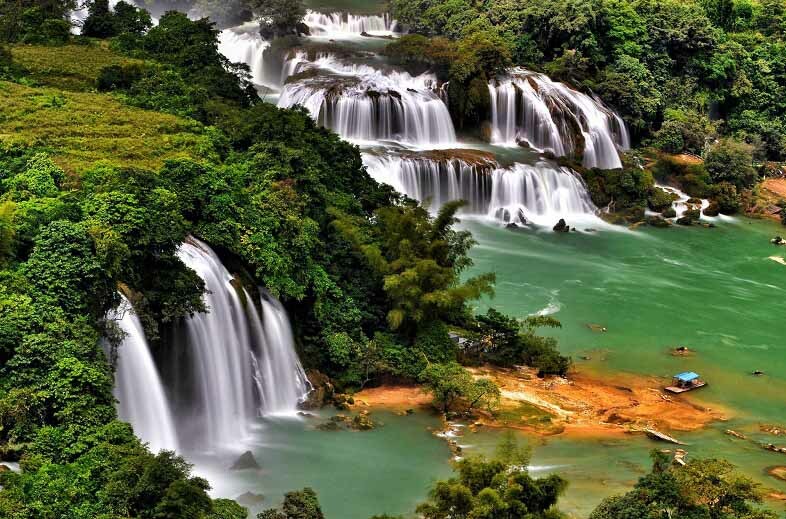 Ban Gioc Waterfall is one of the two waterfalls located on Quay Son River, Cao Bang province, bordering with China. In the middle of the waterfall is the border marker of Vietnam and China. It was determined by the 1999 border treaty. Ban Gioc waterfall is divided into two parts, the main and sub waterfall. 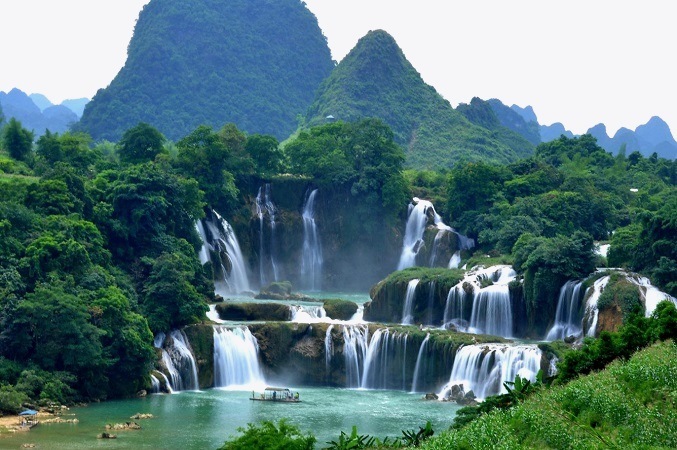 Of which, the sub waterfall is entirely in the territory of Vietnam, located in Dam Thuy commune, Trung Khanh district, Cao Bang province. 1. When is the ideal time to visit Ban Gioc waterfall? The climate in Ban Gioc waterfall is remarkably different between rainy season and dry season. The dry season starts from October and ends in May. This is the time when Ban Gioc falls has a romantic and peaceful beauty. According to experience of people who visited Ban Gioc waterfall, the ideal time to visit this place is August. Because at this time the weather is quite cool. So that visitors can explore the beauty of the waterfall in the most convenient way. 2. How to get to Ban Gioc Waterfall? You can take a bus to Cao Bang city at bus stations such as My Dinh, Giap Bat, or Nuoc Ngam in Hanoi. After arriving at Cao Bang city, continue to take the car to Trung Khanh, then take a ride by motorbike to Ban Gioc. You can consider to choose a car of reputed name such as Mai Luy, Hien Loi or Thanh Ly. This is quite a safe transportation for travelers, especially for female but it will take longer time. This is a vehicle for those who love to explore and adventure. You can refer to the following directions from Hanoi to Ban Gioc waterfall then select the most appropriate route for the trip. Coming to Ban Gioc waterfall, you might be overwhelmed by the magnificent beauty of this wonderful place. During the trip to explore Ban Gioc, you certainly cannot ignore the following attractive destinations. Pac Bo Cave is probably familiar to both domestic and international tourists as it was the place where Uncle Ho lived and worked after returning home in 1941. This cave is located deep in the ravine of a large mountain range. In front of the cave entrance is Lenin stream named by Uncle Ho. This particular stream has a gentle green color. 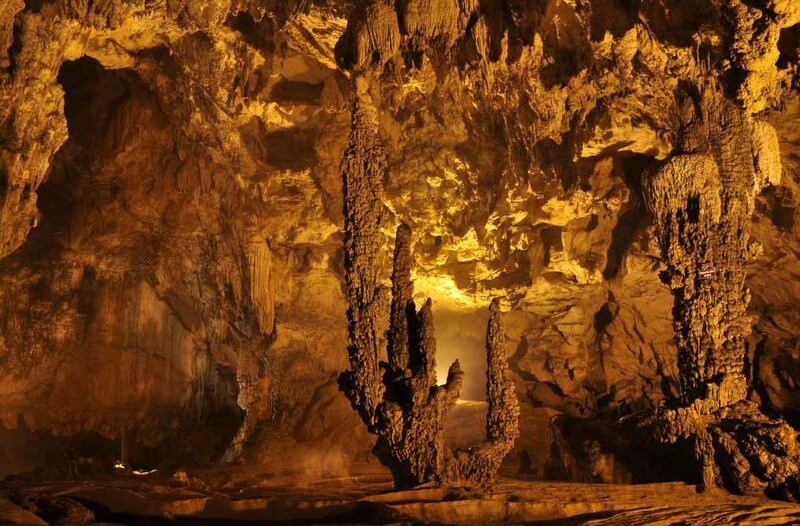 Coming to Pac Bo cave, you not only can see the clear stream in the quiet forest but also can discover the historical relic associated with Vietnam. About 3km from Ban Gioc waterfall is Nguom Ngao cave. It is located in a mountain of Gun village, Dam Thuy commune, Trung Khanh district, Cao Bang province. From 3 main doors of the cave Nguom Ngao, Nguom Lom and Ban Thuon, visitors can enjoy watching the limestone and stalactite blocks in different unique shapes. The cave has 3 zones, each of which has a vibrant rock shingles that make visitors unable to take their eyes off. 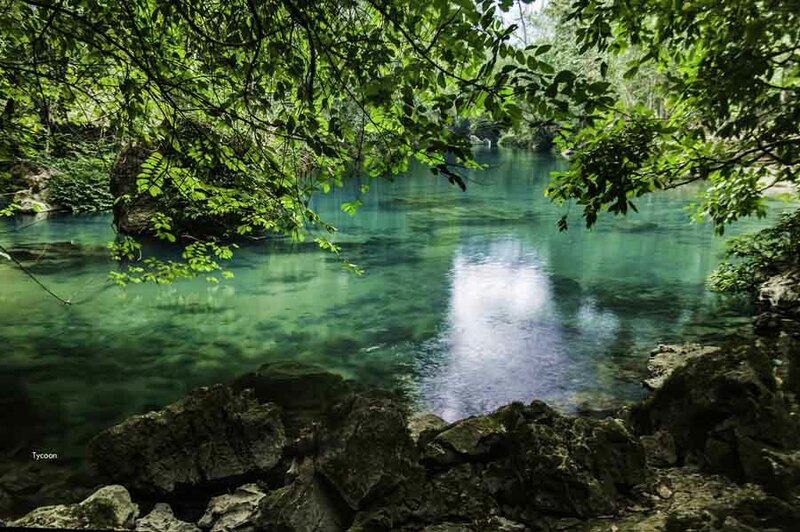 Thang Hen Lake is located in Quoc Toan Commune, Tra Linh District, Cao Bang Province. 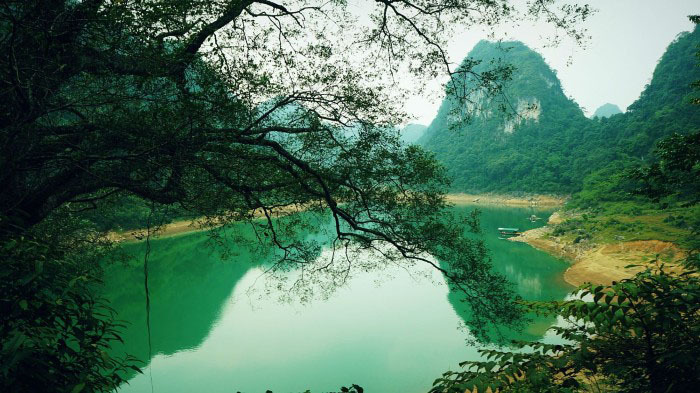 Located at thousands of meters above sea level, the lake impresses visitors with its romantic and peaceful beauty. Besides, the forests and cliff cliffs also add a majestic beauty to the lake. Thang Hen Lake not only give travelers a memorable trip with jade blue water, but also is a great place to take pictures. When visiting Ban Gioc waterfall, in addition to go sightseeing and explore the majestic natural scenery, visitors can also enjoy many special specialties of the northwest. Cao Bang roast duck: this dish is special from the processing to the way the local cook it. It is extremely unique and delicious that will make you never forget. Canarium album steamed sticky rice: This is the characteristic sticky rice of Cao Ban. 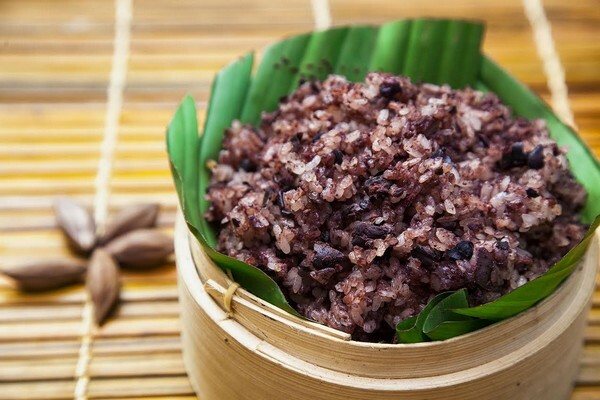 It is made from sweet-smelling glutinous rice with forest canarium. This dish has a very special sweet, the more you eat the more attractive you feel. Trung Khanh Chestnut: another specialty you cannot ignore in Ban Gioc is Trung Khanh chestnut. It is one of the most favorite things bought as gifts by visitors. Whatever you do with it: boil, roast or cook with other ingredients, the chestnut still retains its natural sweetness. This entry was tagged ban gioc, ban gioc waterfall, cao bang, cave, lake, lenin stream, pac bo cave, stream, thang hen lake, vietnam, waterfall. Bookmark the permalink.